Hey, unfornately I cannot get the files in your /release build to work or compile the code for the POC. Could you please check the files or suggest any tips. Thanks. Everything looks fine here, what errors do you get when compiling and when using the library? Are you referring to the heaveninjector or the library? The dll injection simply doesn’t work. The code compiles fine. 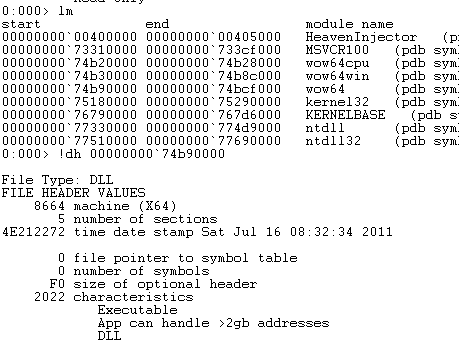 5. payload.dll injects the library u’ve given as argument to process. However, I’ve spotted an issue, you need to specify the fully qualified name of the library since the target application you are injecting to has a different directory path. Still not working. Do you have custom compiler settings on your DLL? Like DEP or optimization disabled? Could you upload your helloworld.dll? Great post packed with info. Thanks for making this! Still curious individuals may also search for works by roy g biv. thank you, unfortunately vx heavens is down. I stumbled upon this because I was convinced that there had to be a way to interface 32-bit and 64-bit code within the same process. This is tremendously informative! One thing to correct is the fact that the selectors 0×23 and 0×33 aren’t actually call gates but they’re simply code segment selectors. Having delved into the kernel, it appears that the GDT simply has those two selectors mapped to the flat address space, thus far calling (or far jumping) simply changes from IA32e compatibility mode into long mode and vice-versa. I was a bit confused about them being call gates, because if they were call gates, *any* jump or call to them, regardless of offset specified, would result in RIP being set to the call gate’s specified entry point. Since this jump clearly respects the offset specified in the far jump (and because CS is being set to either 0×23 or 0×33), it’s simply a code segment selector and not a call gate selector. Also, the call gate selector would result in CS being set to something *other* than 0×23 or 0×33, namely the selector specified in the call gate. Furthermore, since the privilege level doesn’t change (it stays at 3), there’s no kernel transition, stack switch or anything, so it should be a pretty fast transition. 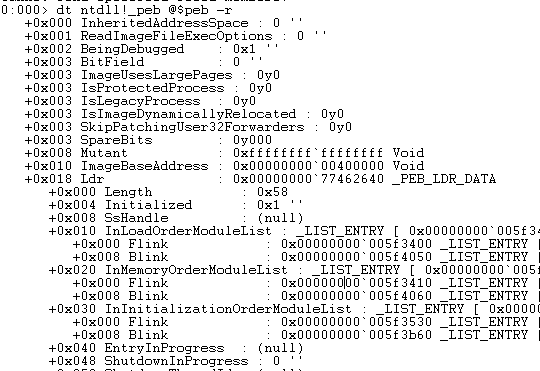 2) CreateProcess will fail after loading 64-it kernel32.dll. This can be fixed by calling the 64-bit CreateProcess instead. 3) which I haven’t solved… when you call the 64-bit kernel32.dll DllMain with PROCESS_ATTACH it disposes of the current console, and creates a new one. Subsequently all console output (printf etc) from 32-bit space will fail. At some point during BaseDllInitialize there is a call to CsrClientConnectToServer which nukes the existing console. Any thoughts on that – especially 3? Hi, sorry for the late reply. I’ve observed the same as well. On the 3rd point, I ended up logging info in a file rather the console. There must be a way to communicate with the console window but I think the easiest way would be to have a trampoline function that switches back to the 32bit segment and print information. You can try and reinstate the original console but don’t know whether that would work or not. Possible call MessageBox with this code? I get only crash. Did you try creating a new thread and using that thread to call MessageBox? Having trouble building the HG code at https://github.com/georgenicolaou/HeavenInjector utilizing the W64oWoW64 code at https://github.com/georgenicolaou/W64oWoW64. 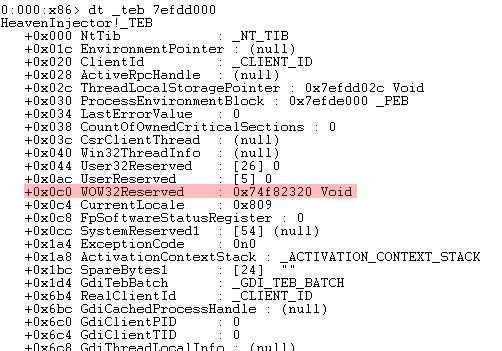 It appears the dll provided with the HI POC code is not 100% compatible with the dll produced by the W64oWoW64. In particular I am having difficulty with FreeKnownDllPage. Any help would be appreciated.